10 days from £2780pp plus international flights. Spend two days in colourful Cusco before heading for the glorious scenery and traditional Sacred Valley mountain villages of the Lares region. Witness a rural way of life that has hardly changed over the centuries, as people dressed in colourful hand-woven textiles trade at markets, work on the agricultural terraces or tend to their herds. Expert guides will bring ancient archaeological sites to life in your imagination, while that first glimpse of Machu Picchu, the ‘lost city of the Incas’ and the sheer scale of the site is something you will never forget. In addition, you’ll enjoy a choice of cultural activities, a guided tour of Cusco and spend time in Pisac. 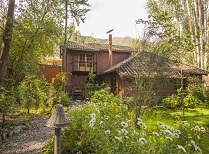 Accommodation is in luxurious lodges in the Sacred Valley, a charming colonial-style hotel in Cusco and a beautiful ecological hotel set in a private 12-acre area of cloud forest below Machu Picchu. This very special adventure can be as you want or need it to be, with flexible amounts of hiking and alternative activities and treks to suit your interests and fitness. Having the services of a driver and vehicle opens up remote areas not accessible by trekking alone, and you can always ask to travel in the vehicle rather than hike if you prefer. 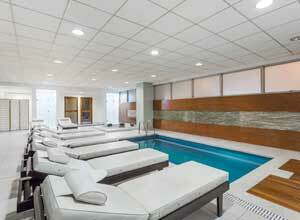 You’ll be met on arrival at Lima Airport and transferred to the Wyndham Costa Del Sol Lima Airport hotel. Here you can relax, enjoy a meal in the restaurant or make use of the fitness centre and indoor swimming pool or opt for a spa treatment. The shared cultural trek begins today, and you’ll be collected after breakfast and driven to the Sacred Valley. You can choose to make the 3-hour trek along part of the Lares Trail from Amaru to Viacha (4328m at the highest point), or you could opt to visit the Awanakancha textile centre, where you can witness the traditional weaving process and buy items to take home, followed by a trip to the traditional market in Pisac. Everyone in the group will meet up at the isolated rural community of Viacha where you’ll learn about artisanal potato farming methods, followed by a ‘Pachamanca’ lunch cooked under hot stones. This afternoon you head by car or on foot to the Inca ruins above Pisac, then you trek or are driven to Lamay Lodge (2958m). Wander in the pretty gardens, relax in the outdoor hot tub, then enjoy a tasty meal before a good night’s sleep. Breakfast, lunch, dinner. After breakfast and a walking tour of Lamay it's a 2-hour drive towards Lares, north of the Sacred Valley. En-route you'll stop at the ruins of Ancasmarca for a guided tour. After lunch there's a choice of activities. 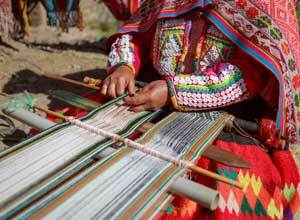 You can drive to the weaving village of Choquecancha to watch the weavers at work, view the Inca ruins and colonial church, or do an easy 2-4 hour hike. If you're feeling more energetic you can tackle a more demanding 4-5 hour hike. Whichever option you select you will arrive at Huacahuasi Lodge in time to shower and change before dinner. The lodge is built into the mountainside and has fantastic views – and each bedroom has its own private outdoor jacuzzi. Breakfast, lunch, dinner. This morning you will be driven to an Andean trout farm in the Huilloc community, where you can taste cerviche. From there you can choose to trek the 3 hours to the archaeological site at Pumamarka or to enjoy a guided tour of the ruins at Maracocha. Here you’ll meet local shepherds before being driven to Pumamarka where you’ll join the trekkers for lunch and a guided tour. Then you can choose between hiking for 3 hours to Ollantaytambo or being driven to Ollantaytambo where you can explore the Inca alleyways. 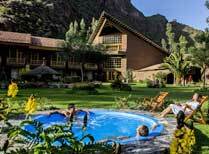 Then you’ll be transferred to K’uychi Rumi Lodge in time to relax in your comfortable Andean lodge before dinner. Breakfast, picnic lunch, dinner. You can relax for the first part of the morning or, if you’re feeling energetic, you can hike to the Inca storage structures for a wonderful view of Ollantaytambo and the valley. Mid-morning the whole group starts a guided tour of Ollantaytambo. 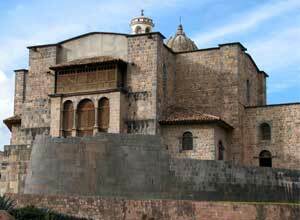 This site was settled in the 15th century and retains the original Inca grid layout and many fine stone buildings. In the late morning you'll catch the train to Aguas Calientes, the town at the foot of Machu Picchu, enjoying a picnic lunch on board. You’ll check in to Inkaterra Pueblo Hotel then have the afternoon free to stroll around the orchid-filled cloud forest gardens, see where the hotel’s organic tea is processed, take a dip in the pool, explore the town or perhaps have a massage in the spa. You’ve a big day ahead of you tomorrow! Breakfast, lunch, dinner. You have a choice of activities in Cusco today – and you can decide whether you’d like to do the activity in the morning or afternoon (activity choice to be decided at the time of booking the trip). 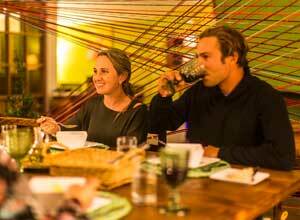 The first option is a Peruvian lunch or dinner experience. You’ll be collected from your hotel and taken to San Pedro market to shop for ingredients. Then you’re taken to a modern 11th floor rooftop kitchen with great views of the city, where you’ll be shown how to prepare a three-course Peruvian meal, then sit down to eat the fruits of your labours. 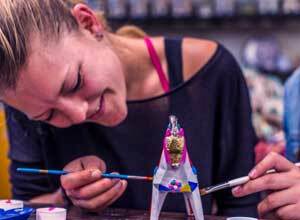 The second option is a half-day Art Trail, including a 2-hour ceramic workshop experience. You’ll lean about the history of Andean art and figures such as the Torito de Pucará that you find on the roofs of mountain houses, and a skilled local artist will instruct you in traditional techniques for making and decorating ceramic plates, cups and other items. You could also choose to take part in a workshop, painting and applying gold leaf to figures of horses or the Torito de Pucará. 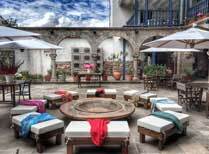 You can enjoy the rest of the day as you wish in Cusco and spend the final night of your holiday at El Mercado. Breakfast, and lunch or dinner if you choose the culinary activity. Price notes: 2019 guide price pp sharing: £2780 on fixed departures from March to December. 9 nights twin-share accommodation in hotel accommodation or mountain lodges as per the itinerary; meals as indicated; vehicle transfers as specified; English-speaking guide in Cusco, Machu Picchu and the Sacred Valley; return train from Ollantaytambo to Aguas Calientes; guided tour of Machu Picchu; entrance fee to Machu Picchu; shared guiding services and lodge to lodge shared trekking itinerary (Day 3 to 8). International and domestic flights and taxes; visas; vaccinations; insurance; drinks; meals not specified; tips; personal expenses; optional activities; visas (currently not required for holders of British passports); Huayna Picchu entrance if required. This trip starts and ends in Lima. You will need a flight to Lima and a connecting domestic flight to Cusco. From Europe, Iberia Airlines and KLM are most frequently used for this route. Return flights from the UK will cost from about £900. We are happy to book flights for you. 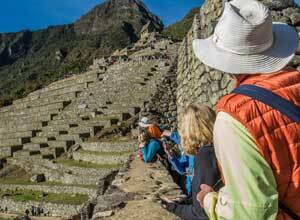 This famous city was the capital of the Inca empire for three centuries. It is the gateway to the Sacred Valley and to Machu Picchu, and there is much to explore and enjoy in the city itself, including magnificent colonial and Inca architecture, great restaurants, shopping and culture. 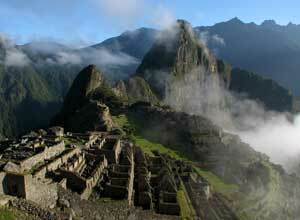 The famous 'Lost City of the Incas’. An unmissable highlight of Peru, reached by walking the challenging Inca Trail, or catching the train to a nearby village. The Casa Andina Standard Cusco Plaza is in a convenient location for the main tourist sites in Cusco and provides comfortable accommodation for its guests. 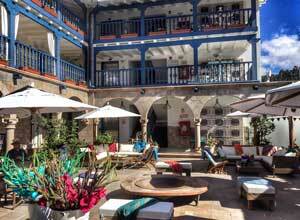 A lovely colonial-style hotel in the heart of Cusco, owned by Mountain Lodges of Peru. Rustic, self-contained accommodation in a pretty garden setting. Wyndham Costa del Sol Lima Airport is a modern hotel located within walking distance of Lima's international airport, offering good accommodation and facilities. 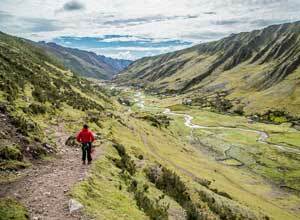 This excellent Andean trek in Peru is run by a company committed to helping their local communities. 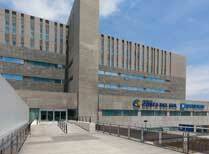 They work through a charity arm known as Yanapana. Taking this trek not only helps local people, but it's a great experience for you as you stay in comfy but remote mountain lodges, and there is flexibility in how much hiking you have to do. Yanapana is a not-for-profit Civil Association whose purpose is to reduce the condition of extreme poverty in the Andean Highlands, and improve the quality of life through sustainable community development. Most of the projects are related to education and health for those families and individuals in poverty so they have helped schools and clinics, but they also help with income-generating projects such as organic coffee production, women making handmade textile, provision of clothing in the cold periods and so on. Their work here is invaluable to many people, and taking this trek helps them achieve their goals.